The arrival of December means a month filled with holiday parties for most people. However, the enthusiastic turnout at local races over the past two weekends shows that for many local runners December is also a time for festive races, and of course costumes. 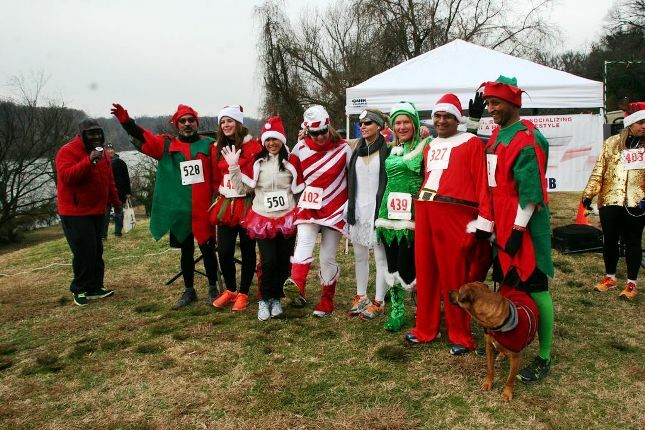 With gray skies and rain in the forecast, it looked like the weather might be in danger of dampening the festivities at the inaugural 12ks of Christmas Holiday Run in Georgetown on Saturday. Luckily the morning turned out to be a dry one, although race director John Braithwaite admitted that he had been hoping for a dusting of snow to add a little bit more Christmas feeling to the race. There was plenty of Christmas spirit on display among the 600 competitors in the sold-out races, and a large proportion had gone to a lot of effort to dress up for the occasion. Some of the non-running supporters joined in by wearing Christmas hats, and there was even a dog in a Santa suit. Creatively-named teams entered for the races included the Sugar Plums, Ugly Christmas Sweaters and Holiday Heroes, and a host of Santas, elves and reindeer could be seen gathered around the start-line. The clear crowd favorite however, and pre-race costume award winner, was a warm and furry looking Rudolph. Rather appropriately, the start-line was located under the watchful eye of a giant inflatable Santa on top of one of the nearby apartments. Also in keeping with the holiday theme, runners were entertained by Christmas music as they lined up for their races. The course for both the 5k and 12k was out and back along the C&O Canal, and patches of snow and ice along the narrow trail made for challenging racing conditions. This didn’t seem to slow down Craig Miller too much, as the Alexandria resident had a comfortable lead when he crossed the finish line to win the 5k race. Impressively, Miller was also the first costumed runner to finish as he embraced the German Christmas spirit by racing in a rather fetching Oktoberfest outfit. In a demonstration of near-equality, the top 10 finishers in the 5k included 4 women. The first of these, finishing fourth in the race overall, was Jessica Roberts of Virginia. Miller’s European theme was continued in the 12k race as it was won by Lithuanian Vladas Navagrudskas. After moving to DC just six months ago, he has already been involved in a number of local races. The 47-year-old won his age category and finished 14th overall in the MCM 10k back in October, but this was Navagrudska’s first outright win in a DC race. Having started his running career as a track athlete and now being more used to racing on the roads, Navagrudskas said that he struggled a bit with the conditions underfoot on the C&O path. However, as with Miller in the shorter race, he seemed to cope with the course very well and managed to finish over 2 minutes ahead of runner-up James Smith. The third runner across the line in the 12k was also the overall ladies’ race winner, Hallyn Brewster of DC. Of course Christmas is most importantly a time for giving, and the runners at today’s race could go home happy in the knowledge that they had helped to support the W.H.A.L.E.R.’s Creation Annual Foster/Adopted Youth Christmas Dinner. Money raised by the race will help offset the cost of hosting a Christmas week dinner for local foster kids at Olde Town Inn, Upper Marlboro. This event is organized every year by Donnell Long, owner and chef at the restaurant. One final ingredient needed for a merry Christmas is a cup of festive cheer, and the race organizers dutifully obliged by providing eggnog and cider as part of the post-race refreshments. A fitting end to a fun morning of racing, and there is sure to be more of the same to follow as DC Running Club’s event calendar for 2014 includes the Island Rum Run Half Marathon & 5k in Puerto Rico.